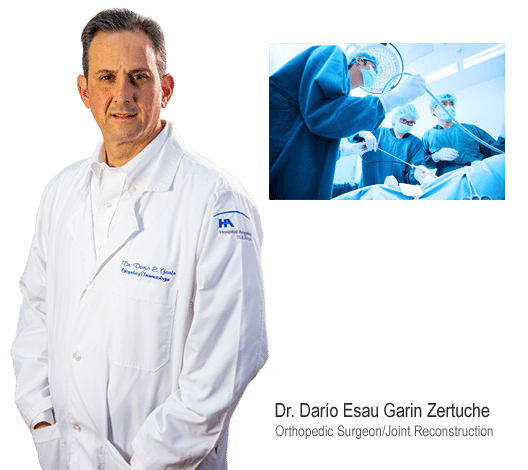 Dr. Dario Garin who heads our Orthopedic Clinic, is a distinguished orthopedic surgeon with an international resume that demonstrates a range of knowledge found only in the top hospitals in the world. He is Mexico’s only orthopedic surgeon to offer the Smith & Nephew BIRMINGHAM HIP resurfacing System, a metal hip joint that is the only resurfacing prosthetic hip with 10 years’documented success. Due to the minimal loss of healthy bone, low risk of dislocation and excellent results the BIRMINGHAM HIP is the hip of choice for active patients. In a traditional hip replacement surgery a significant amount of healthy and damaged bone is removed and replaced with a prosthetic bone. Our surgeons perform hip resurfacing, a technique that involves the removal of less healthy bone; we only replace the damaged area. The type of hip resurfacing procedure that a patient receives and how long it is likely to last is largely dependent on the type of prosthesis used and the age of the patient. The cost of joint replacement procedures in America reflects the quality of joint used, with hip resurfacing costing around £50,000. Our post-operative care is second-to-none. Dr. Garin stresses that we always keep in touch with patients by phone or email – it is important to make sure that they are recovering well, with minimum pain, and gaining the mobility and flexibility they have not had for so long. If you would like to speak to a doctor about whether hip arthroscopy would be the best treatment for you then contact us today by using the inquiry form on the bottom of the page. For more information about our packages and how having Hip Resurfacing Surgery at MedicalMex helps you regain movement and live pain free, please read our most frequently asked questions or contact us today using our FREE consultation form at the bottom of the page. What to expect from hip resurfacing surgery? Unlike traditional total hip joint replacement, hip resurfacing doesn’t remove the ball at the head of the femur and replace it with a metal or ceramic ball. Instead, a hip resurfacing procedure reshapes the damaged hip ball and caps it with a metal prosthesis. The damaged hip socket in the pelvis is fitted with a metal prosthesis — like that used in conventional hip replacement surgery. The cap is placed over the smoothed head like the way a dentist caps a tooth. The cap is held in place with a small peg that fits down into the bone. Hip resurfacing patients must have enough healthy bone in the femoral head to support the cap. Our surgeon will make an anterior or posterior approach to the hip, making a large incision in the side of the thigh, which allows the surgeon to see both the femoral head and the acetabulum (or socket). The femoral head is then dislocated out of the socket. Special powered instruments are used to shape the bone of the femoral head so the new metal cap will fit snugly on top of the bone. Hip arthroscopy is performed under general anesthesia and requires a 2 to 4-night hospital stay once the surgery is complete. Are you an ideal candidate for hip resurfacing surgery? A male patient under 55 who is active, has good bone density and a large, healthy femoral neck. Our hip arthroscopy surgeons will also consider older women and men as good candidates if they have good bone stock and an appropriately supportive femoral neck. Women tend to have more difficulty obtaining long term benefits of hip resurfacing surgery, though large boned women with hip joint cups larger than 50 mm have the same success rate as men. Patients who have been diagnosed with primary osteoarthritis, secondary osteoarthritis due to trauma, and those with a mild slipped capital femoral epiphysis with secondary osteoarthritis are among candidates in a reasonably narrow range acceptable to our orthopedic surgeons. Relative youth, density of bone stock and a hip joint socket size of 50mm or greater are specific criteria that are be good predictors of success for hip resurfacing surgery at MedicalMex. What's included in your hip resurfacing surgery medical package? All hip arthroscopy patients are assigned a Patient Facilitator, who takes care of all arrangements free of charge. Your Patient Facilitator will give you a full itinerary that tells you exactly what to expect every step of the way on your medical travel trip.